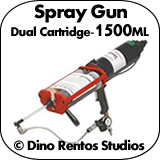 1500ml Dual Cartridge Poly Spray Gun - Dino Rentos Studios, INC. Attach this spray gun to a standard air compressor. Plug in a Polyspray cartridge and coat your foam sculpture. Many cartridges available to coat foam.